The Fairview 40 is our lightest travel backpack that conforms to maximum EU carry-on dimensions. 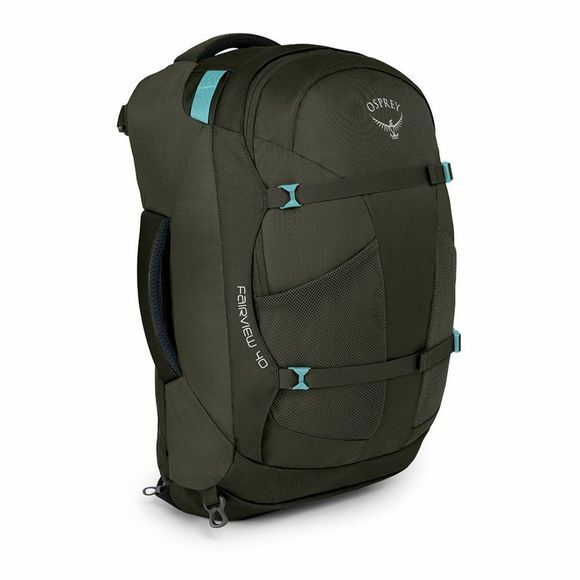 Featuring a zip-away spacer mesh ventilated backpanel, the Fairview can be carried like a backpack but packed like a suitcase. Fairview’s backsystem offers an impressive women's specific fit, with an ergonomically shaped hipbelt, harness, yoke and backpanel. The strong and durable backsystem means you can carry your gear comfortably when travelling between hotels, the airport or beyond. Cushioned carry handles on the top and the sides and the removable shoulder strap allows you to easily grab the travel pack off airport baggage carousels and carry quickly with ease. Your gear is readily to hand, with the inclusion of a large zippered opening that allows access to the main compartment, featuring lockable zips for increased security. The inner compression straps allow you to fully maximise the capacity whilst securing your belongings. Look a little closer and you'll also find a top stash pocket for electronics and sunglasses, dual mesh front pockets for water bottles and a padded internal laptop sleeve. All of these features combined make the Fairview 40 the ideal travel companion for your next business meeting or weekend get-away. Santa Cruz California 1974. Mike Pfotenhauer sat at his sewing machine with a head full of ideas and a burning passion to build the most innovative backpacks to the highest standard. Fast forward to 2015. One man’s vision has grown into a wide range of Osprey rucksacks and accessories that are being used from the highest mountains to the most remote islands and everywhere between.